Watton is one of the most pleasing of Norfolk's small towns. It is little known by outsiders, not least because it is isolated on the edge of the British Army's battle training area. Nineteenth Century Watton was prosperous, with a modicum of civic pride. Perhaps the best evocation of Watton in those times is in DJ Taylor's haunting novel Kept. But this part of East Anglia, the Breckland, fell on hard times in the 1980s and 1990s. Unemployment was high, and the area has one of the lowest proportions of adults who have been through Higher Education in the country. By the early 1990s, the once-busy High Street was lined with boarded up shops. The opening of a large new prison on the old airfield provided some jobs, but it was not until a large injection from the European Social Fund that the area really took off. The Wayland Initiative focused on developing the area for tourism, presenting Watton as the heart of an area of rolling woods and interesting villages. At the entrance to the villages, the village name signs have a corporate identity, with the Wayland logo, as if this was some minor East Anglian Ruritania. But it seems to have worked: today, Watton High Street is proudly busy again. As part of the Initiative, the local churches were encouraged to be open, or at least accessible. It took some of them longer than others to come around to this way of thinking, but today, at last, virtually all of the Watton area churches have either keyholder notices or open doors. St Mary is open when the parish office, in an extension on the north side, is open. At other times, there is a key. 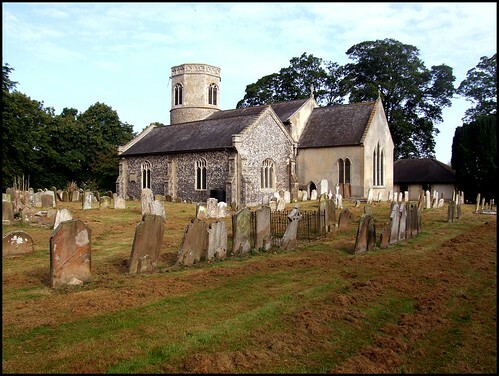 The church sits on the edge of the town on the road to Dereham, and it is that unusual thing, an urban round-towered church. 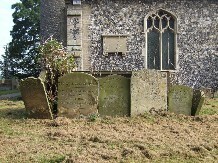 There are only about half a dozen of these left in East Anglia, because most urban churches underwent considerable renewal during the medieval period. However, at first glance it is obvious that the major rebuilding work here was done at a much later date. The little 13th Century church is flanked by two massive 19th century aisles. It is as if three churches had been joined together side by side, and reminds me of boats floating in a bunch, tied together. 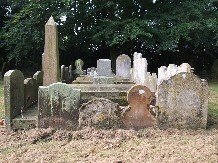 As if in sympathy, older headstones in the graveyard have also been collected together into bunches, to allow for easy mowing. As you would expect, you step into an interior which is almost entirely Victorian, but it is actually more interesting than it first appears, because the massive rebuilding of this church happened in 1840. The aisles were built to accomodate an extra 220 seats in what was still a kind of preaching box: there is no view into the chancel from most of the church. The great wave of enthusiasm, generated by the Oxford Movement and the Camden Society, to restore our parish churches to their medieval integrity with a focus on the altar, had still to reach this lonely place; and so, this is one of the last pre-Ecclesiological restorations in England. The later Victorians would also leave their mark, with a pretty screen and some fairly middlebrow glass. But the unforgettable feature of the interior is the lovely poorbox of 1639, aparently carved in effigy of the Minister of the time. He is depicted holding a bag of money and with a smile on his face; his chest is carved with the familiar invocation to Remember the Poore. This encouragement of charity was an important part of the Puritan project of the time: it wasn't all smashing glass and beheading Kings. However, if you compare this naive little folk-carving with the fabulous art being produced as a result of the Renaissance at this time in the rest of Europe, you can't help thinking that we paid a high price for Puritanism. 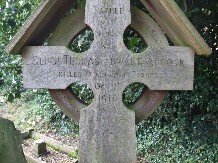 There are some moving WWI memorials in the south aisle, and out in the graveyard there is a great curiosity: a wooden WWI cross memorial to Thomas Edward Adcock, the son of Mr. and Mrs. W. J. Adcock, of West End Terrace in Watton. A resident of Gorleston-on-Sea, he had enlisted in the Norfolk Regiment on 3rd August, 1914. This was the day before the War broke out, and he was 20 years old. Amazingly, he survived almost the entire Great War, to be killed just a month before the Armistice. His is one of 190 Commonwealth war dead bodies to lie at Underhill Cemetery near Ypres in Belgium, on the north-western edge of Ploegsteert Wood.